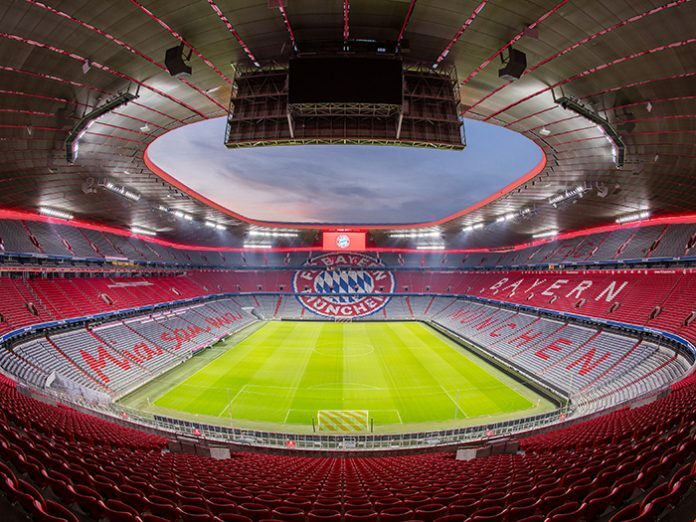 “We are proud to have the opportunity as the lighting partner of FC Bayern to present one of the world’s most modern stadiums in a new way with our lighting solutions in the inside and outside areas. Translating the specifications and ideas of the architect and the light designer into tangible products was a major challenge, which we were able to meet thanks to our expertise in stadium lighting and as a full-range supplier. We are pleased to see the Allianz Arena shine in a new light,” said Alfred Felder, CEO Zumtobel Group. The implementation of the complete lighting solution for the Allianz Arena began at the start of the season 2018/19. With its all-in service, the Zumtobel Group provides one of the most comprehensive offerings in the entire lighting industry. The turnkey lighting solution for the stadium includes the entire project management and project execution, from recording the roof structure, production, delivery and installation to the commissioning of the systems. In the third construction phase, scheduled for 2020, the balloon lights on the esplanade in the outside area of the stadium will be replaced. The new, customised lighting solution is currently being developed in close cooperation with all project partners. “We are delighted to have found a renowned lighting partner in the Zumtobel Group. The Zumtobel Group contributes its comprehensive expertise and decades of experience and, in addition to an outstanding lighting solution, provides us with the full service we are looking for,” said Managing Director Jürgen Muth, Allianz Arena München Stadion GmbH. “With around 3.5 million visitors per year, the Allianz Arena has been a football temple and a venue for events since its opening in 2005. The new extensive effect lighting brings an additional emotional component into play for the visitors,” said Andreas Jung, FC Bayern München Executive Board Member.